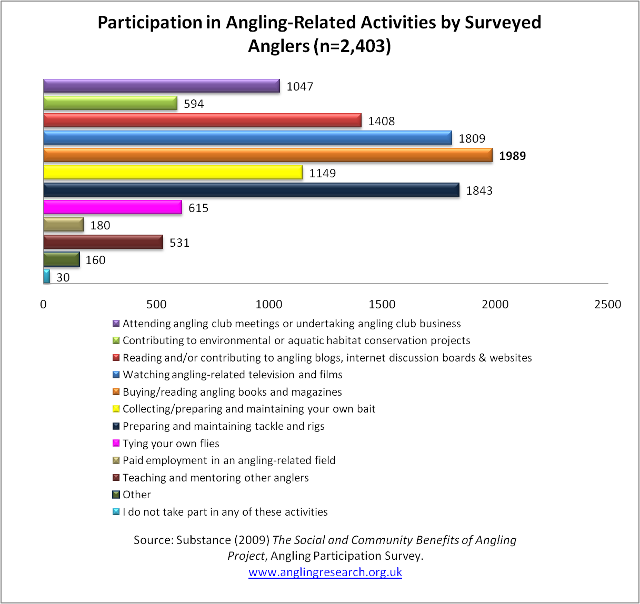 This bar chart shows the range of angling-related activities participated in by respondents to the 2009 angler questionnaire survey. Respondents were given a list of ten possible activities and asked to select all the activities they engaged with. The highest response was 'buying/reading angling books and magazines' (1,989 or 82%), with 'preparing and maintaining tackle and rigs' (1,843 or 76%) and 'watching angling-related television or films' (1,809 or 75%) also very popular. The other activity engaged in by more than half of the sample was 'reading and/or contributing to angling blogs, internet discussion boards & websites' (1,408 or 58.5%). Most notably these results underline the importance of engagement with various forms of media (magazines, books, television, the internet) as part of angling participation. To view a larger version of this graph, use the link below titled 'Original'.